There is this really kewl stamp store based in Illinois that I usually go to when I have a dollar or two to throw at my collection. It is run by Ralph Schneider and I asked if he would look at the last post I made and answer some of my questions. I did not think he would have the time to do it or if he did get around to it, he would get back to me in a week or so. His answers arrived just a few hours after I sent him the link. Scott # 1: (MI 1Xb) orange on hand made paper. Scott # 2: appears to be hand made paper, but he wasn't sure. Scott # 3: The first is hand made paper, the second he couldn't tell. Neither are laid paper. He did not mention # 4, but he did lead me to the book I need to get to do my research. I think I mentioned that neither Scotts, nor ANK provided adequate descriptions as to determining what is what. Mr. Schneider recommended the Michel Austria Specialized catalog. 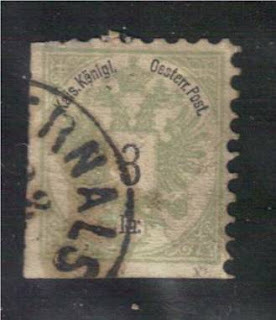 He also recommended that I join AUSPS (Austrian Philatelic Society) which I will look into. From what I can gather at this time, joining would be a great learning experience. Vengeance of the Ghost is progressing. The editting session of last weekend was a great help. Some rather jumpy parts to the story were ironed out so that it reads much easier. Besides that, their input is always great motivation. 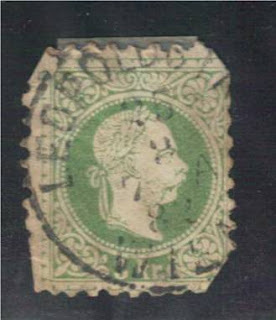 This poor stamp (filler till I can get a better one) is Scott # 28: 3 kreuzer green from the 1867-72 issue. 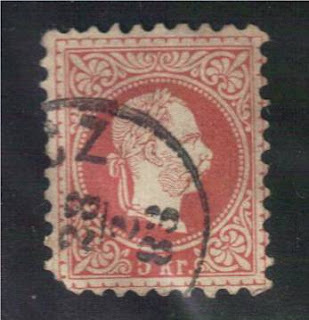 This is Scott # 29: 5 kreuzer rose also from 1867-72 issue. I believe it is the Type II variety. 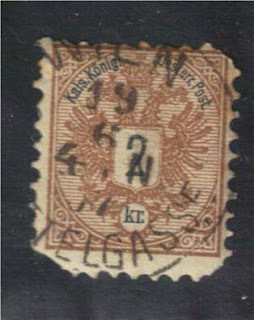 Scott # 41: 2 kreuzer brown from 1883. 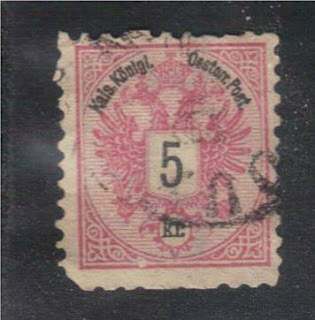 Scott # 43: 5 kreuzer rose from 1883. All of these stamps are fillers until I get better copies.